La Misión de Fray Diego is an antique 17th century mansion, restored and converted into an exquisitely charming boutique hotel in Mérida Yucatán. The hotel offers 20 elegant and comfortable standard guestrooms, four special guestrooms, and one junior and one master suite, each with Jacuzzis. Included in these delightful accommodations is first class service and a convenient location to the main square, just one block and a half away. Over 400 years ago, La Misión de Fray Diego was part of the Monjas Church (Nuestra Señora de la Consolación), the second-oldest church in Mérida. The convent, rumored to be the first in Mérida, was built with private donations among local individuals and was completed on June 22, 1596. The Conceptionist nuns managed the cloisters until October 12, 1867, when they were expelled by General Manuel Cepeda Peraza; today it is the Casa de la Cultura Municipal. At one point the convent occupied the entire block between Calles 61, 64, 63, and 66A. 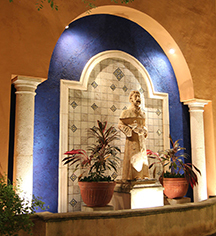 La Misión de Fray Diego, a member of Historic Hotels Worldwide since 2016, dates back to the 17th century. La Misión de Fray Diego takes its name from the first Bishop of Yucatán, Diego de Landa, who lived in town during the initial spread of Catholicism among the Maya. Airport: The closest airport is Manuel Crescencio Rejón International Airport (MID): 7.6 km, 20 minutes. An airport shuttle may be arranged through the hotel's concierge, rates apply. Cancellation Policy: Must cancel three (3) days in advance to avoid one (1) night penalty. For groups, must cancel 30 days in advance. Deposit: No deposit; valid credit card required at time of booking. Early Check-In/Late Check-Out: One (1) night charge for early check-in and late check-out. Extra Person Fees: $19 USD, with taxes. Hotel/Resort Fees & Taxes: 16% IVA, plus 3% ISH. Occupancy Restrictions: Maximum four (4) people in rooms with two (2) beds; two (2) people in rooms with one (1) bed. Parking: Free parking, with 24-hour valet service. Payment: Credit cards are accepted. Smoking Policy: By request, in limited rooms. 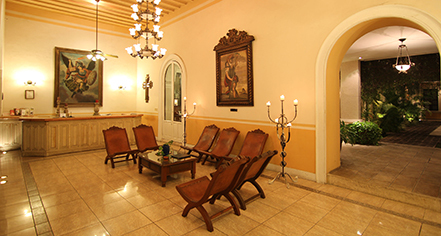 La Misión de Fray Diego is an antique 17th century mansion, restored and converted into an exquisitely charming boutique hotel in Mérida Yucatán. The hotel offers 20 elegant and comfortable standard guestrooms, four special guestrooms, and one junior and one master suite, each with Jacuzzis. Learn more about the History of La Misión de Fray Diego .